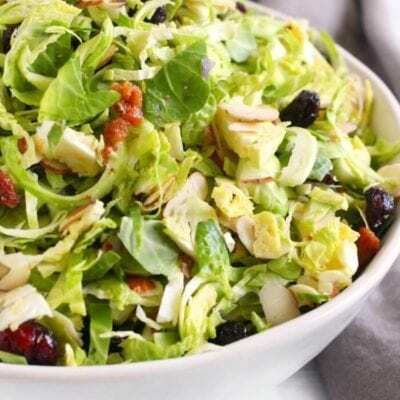 Brussels Sprout Salad is a simple and delicious salad with bacon, dried cranberries, almonds, and a light citrus dressing. 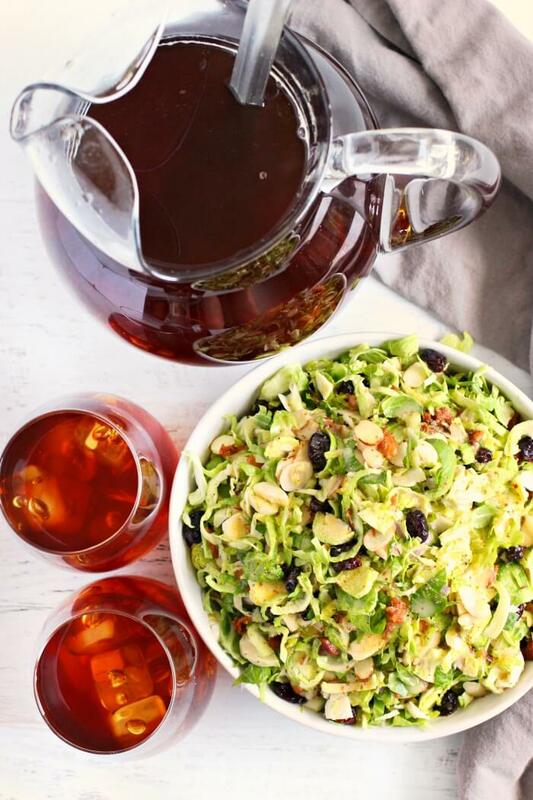 Brussels Sprout Salad is the perfect addition to any meal – or a great meal on its own! I had a Brussels Sprout Salad with Citrus dressing at a restaurant in Boston recently and I just knew I had to make it at home! We like to serve this with a cold glass of Tetley® Tea, our easy shepherd’s pie, and some peanut butter cookies. Or add some baked chicken to make it a main course. Brussels Sprouts – Shave (or thinly slice) your Brussels sprouts. I like to use a good sharp knife for this chore, but you could also use a food processor. Dried Cranberries – If you’re able to find sugar free dried cranberries, that is preferred. They’re often available at health food markets. If you can’t find them, this salad is still delicious with traditional (sugared) dried cranberries. Bacon – We like to make our bacon in the oven ahead of time and keep a bag of pre-cooked crumbled bacon in the freezer. You can also buy bags of pre-cooked crumbled bacon at the market. They’re usually near the salad dressings. 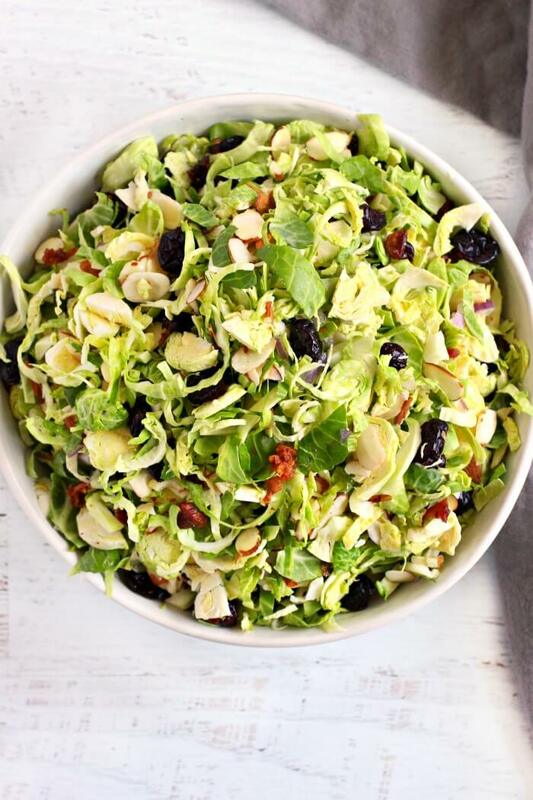 Almonds – Sliced almonds add a beautiful crunch and nutty flavor to this Brussels sprout salad. Red Onion – Red onion (which I will forever believe should be called purple onion) should be small chopped or minced in this recipe to avoid an over powering flavor when you bite into it. We want this flavor to be subtle. Sunflower Seeds – Sunflower seeds or pumpkin seed kernels (also called pepitas) add an additional layer of crunch! Citrus Dressing – Our homemade citrus dressing is simple and delicious, you probably have all the ingredients already! First, chop off the hard end of the Brussels sprouts and discard. Then shave or slice the Brussels sprouts very thin. This can be done by hand with a knife or with a food processor. 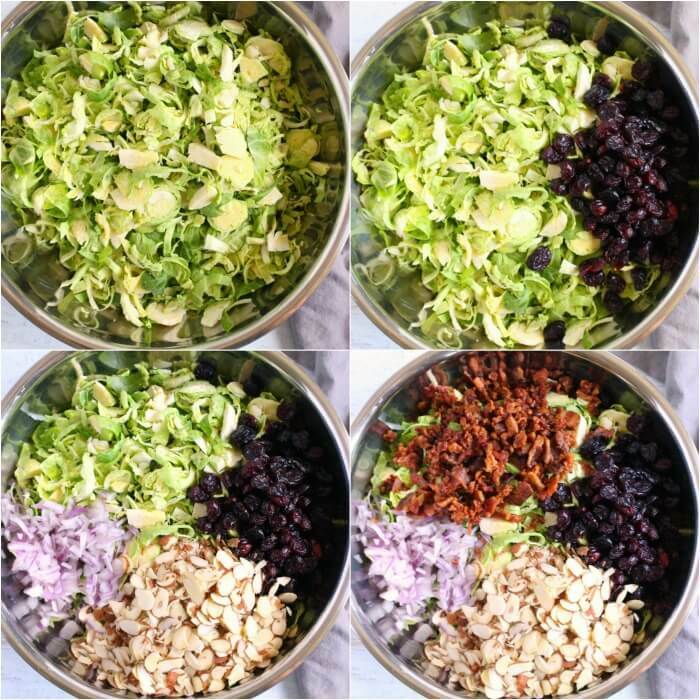 Then, add shaved Brussels sprouts to a medium-large bowl along with the cranberries, bacon, almonds, and red onion. Finally, drizzle with citrus dressing. 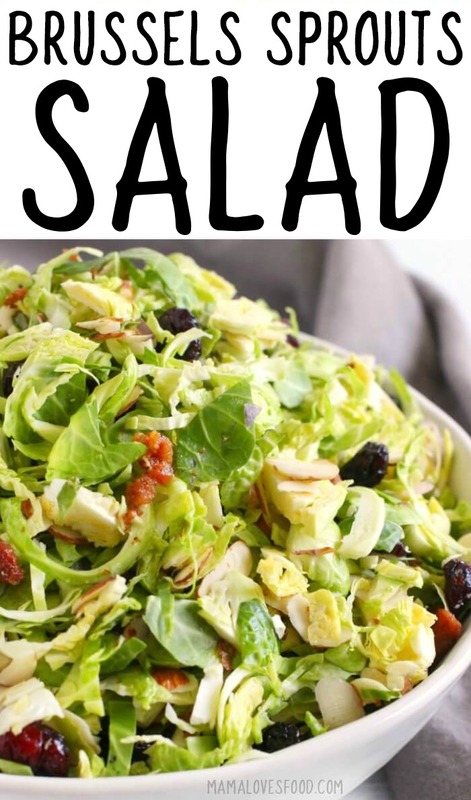 A simple citrus dressing brings this Brussels Sprouts Salad to life. We use orange juice and just a touch of lemon juice, with olive oil, mustard and garlic to make a bright and delicious vinaigrette. I doubt I got the dressing exactly the same as that restaurant in Boston, but I know there was orange juice involved, and I know it tasted fantastic – since we nailed those two (critical) points, I’m calling it good! 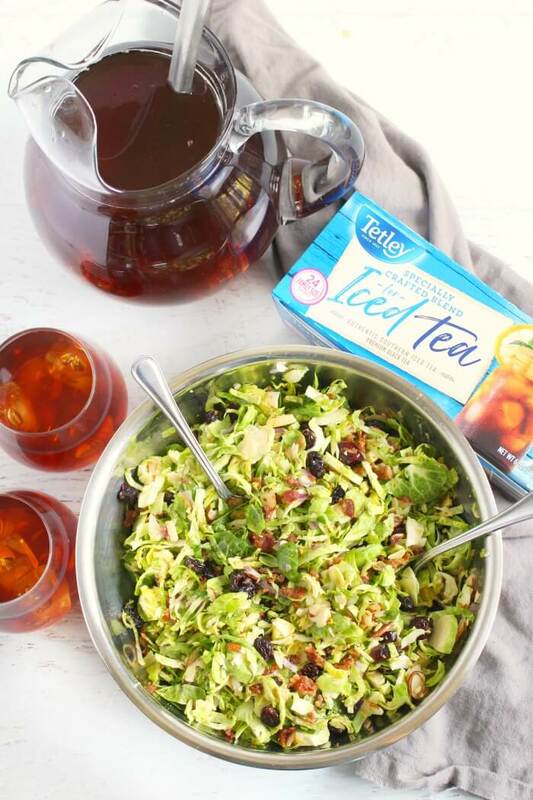 We picked up our Tetley Tea (along with all the other ingredients for our Brussels Sprout Salad) at Publix. Tetley Tea is located on the breakfast aisle – make sure to grab the family size so you can easily make a full pitcher. 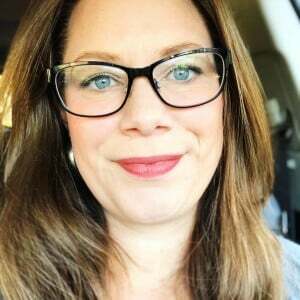 I like to keep an unsweetened pitcher in the fridge at all times – that way we can doctor it up the way we like (I’m an unsweetened gal, but my daughter Jo likes allllll the sugar)! I’m excited about Tetley Tea’s new specially crafted iced tea blend with 12% Nilgiri Tea to help enhance the tea’s crispness and sweetness and hold flavor. It never gets cloudy or bitter and always tastes great. 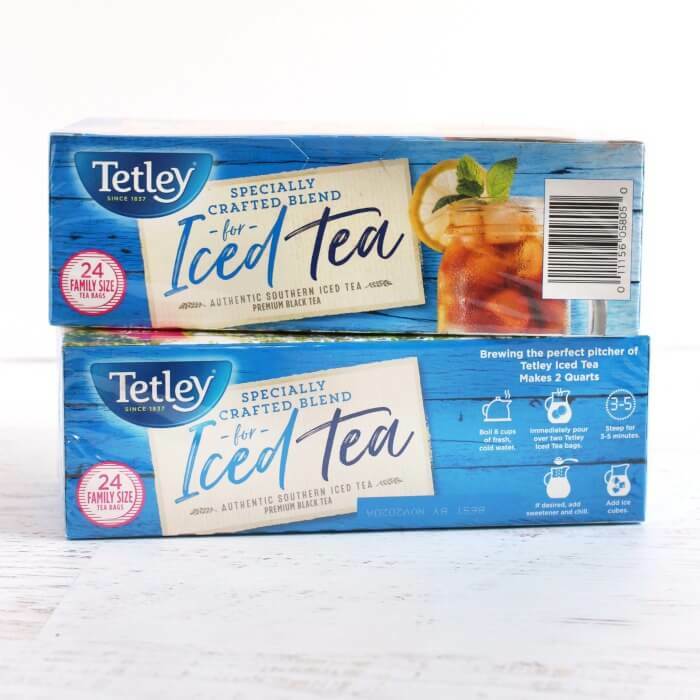 Keep an eye out, because you can get Tetley® Iced Tea 24 ct. for only $1.50 at Publix from 1/23/19-1/29-19! ★ If you’re using pre-cooked bacon (whether you made your bacon in the oven earlier or you bought it), microwave the bacon for about a minute prior to adding it to the salad to crisp it up and bring out the flavor. ★ Try topping your salad with an earthy cheese like blue cheese or goat cheese to enhance the flavors even more. ★ For a lower calorie version of this salad, use unsweetened cranberries, halve the almonds, and sub half the oil for water. 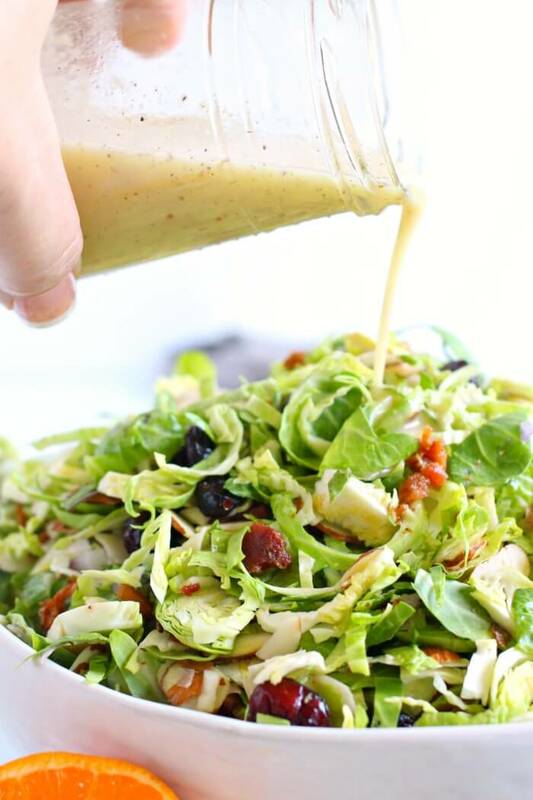 ★ Skip the citrus vinaigrette and try tossing your Brussels Sprout Salad with our honey mustard recipe or some creamy Italian dressing. 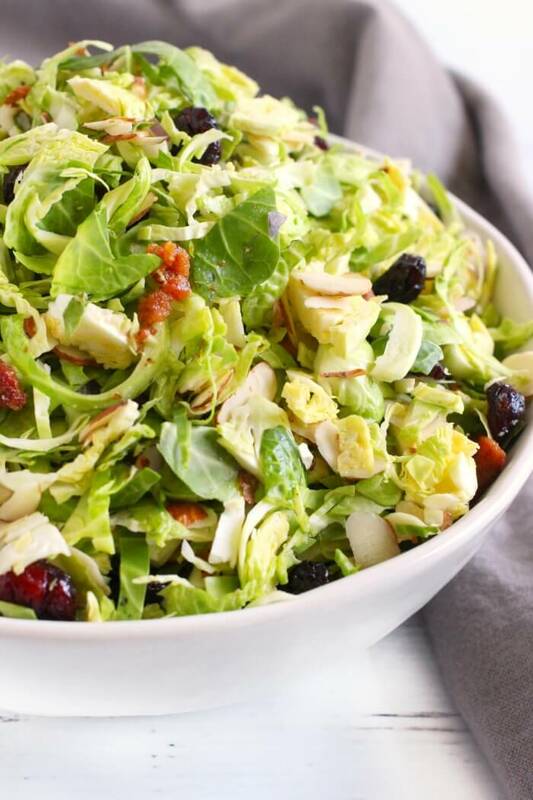 ★ Finish your Brussels Sprouts Salad with some crumbled goat cheese or blue cheese. Fragrant earthy cheeses pair beautifully with Brussels sprouts. ★ Try pulling out a quarter of the sprouts and roasting them first for even more flavor. Brussels sprouts are not lettuce. Brussels sprouts are of the same species as broccoli, cabbage, collard greens, kale, and kohlrabi. Brussels sprouts are cruciferous and belong to the Brassicaceae family. You shred Brussels sprouts with a sharp knife or food processor. My preferred method is with a santuko style knife. I find that unless you’re doing an exceptionally large batch, the knife is faster than setting up, using, and then cleaning the food processor. Can you shave Brussels sprouts in food processor? You can shave Brussels sprouts in food processor. In a food processor fitted with the slicing attachment, you can coarsely shred the Brussels sprouts. If you don’t have a food processor, you can thinly slice the Brussels sprouts by hand, as described above. Brussels sprouts are nutty, savory, crunchy and soft – all at once! When eaten raw like in this salad they have a cabbage or hearty lettuce like texture but with much more flavor. When eaten roasted (like in our roasted Brussels sprouts) they’re crunchy on the outside while tender. Brussels sprouts pair beautifully with a bright acid like citrus or vinegar as well as with earthy cheeses like goat cheese and blue cheese. How long do shaved Brussels sprouts last? Properly stored, raw shaved Brussels sprouts will last for 3 to 5 days in the refrigerator (without dressing). If you’ve prepared the recipe and added the dressing, they will last more like 2 to 3 days. Make sure if you’ve rinsed your Brussels sprouts, to dry them thoroughly before storing. 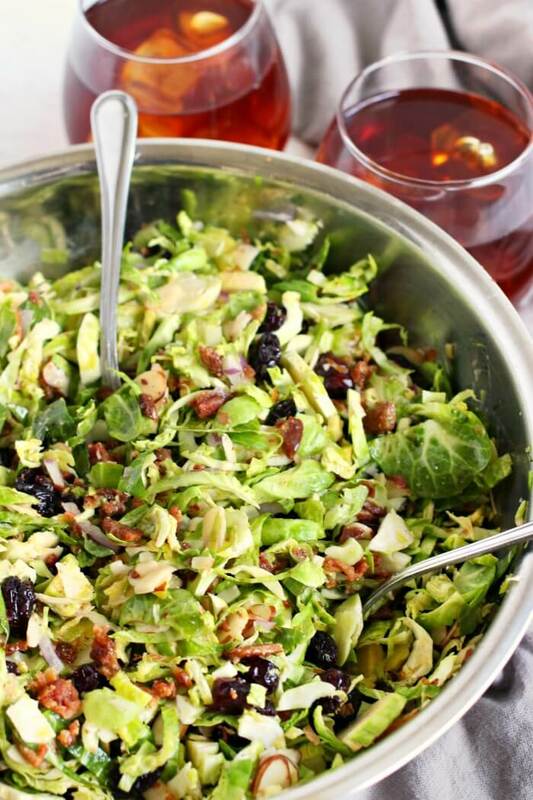 Brussels Sprout Salad pairs well with so many dinner options. Here are a few of my favorites! Santuko knife – My favorite knives for cutting vegetables! These knives are the perfect size and shape, handle great, and most are super reasonably priced. Also, I just love that mine is fun and colorful! Mandoline slicer – Make pickle slices, or scalloped potatoes. French fries, and shaved onion. You won’t get a better or quicker thin slice than with a mandoline. Just make sure to use the safety guard, no one *actually* wants a knuckle sandwich! End grain cutting board – Mine is my absolute favorite cutting board and the one that I get the most compliments on. And p.s. I have a lot of cutting boards. It really is absolutely stunning, and knows how to take a beating. We use it every single day! As a kid my grandma (who lived right down the street!) served iced tea with every meal. And I turned my nose up at it every time. Until one day when she told me (as only grandma’s can do), to get over it and take a sip. I’ve been in love with iced tea ever since. All the way through my law school years, any time I could get away for an afternoon, I’d pop over to grandma’s (or Dreena as I called her) for lunch. We’d have some salad and iced tea. And of course, cookies for dessert. Oh, and fruit salad (always with bananas in it!). I’m happy to say that I’ve passed our love for iced tea onto my daughter as well, and we always have Tetley Tea bags on the counter ready to brew. Chop off the hard end of the Brussels sprouts and discard. Then shave or slice the Brussels sprouts very thin. This can be done by hand with a knife or with a food processor. 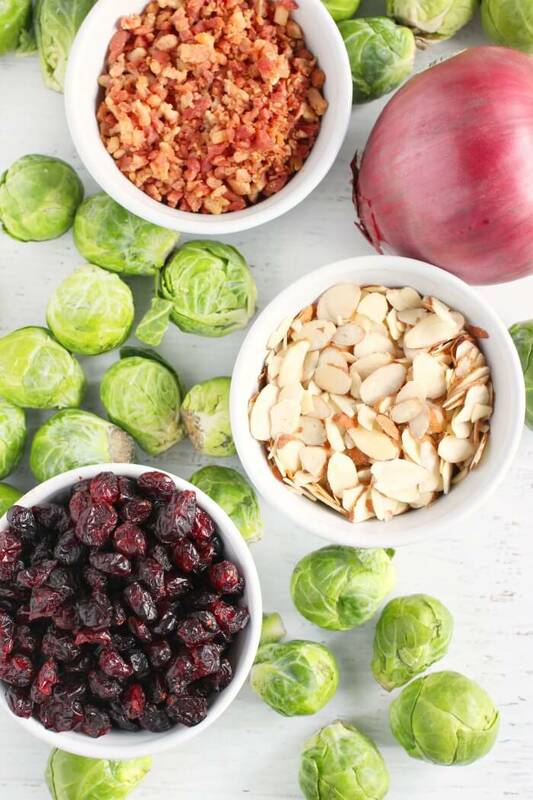 Add shaved Brussels sprouts to a medium-large bowl along with the cranberries, bacon, almonds, and red onion. Whisk or blend all ingredients together. I strongly suggest blending for a more uniform flavor and texture. This sounds like the perfect side salad with a lot of crunch, a little sweetness and creamy cheese. I love the idea of trying it with roasted brussels sprouts too. 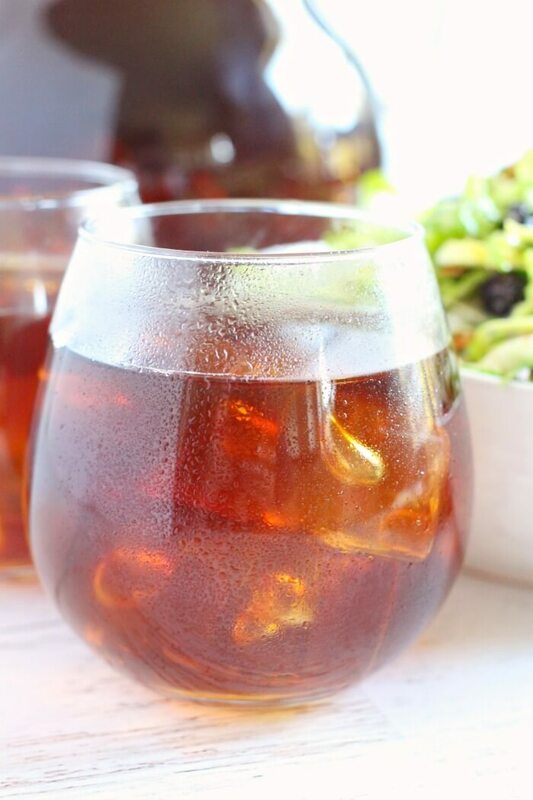 As to iced tea, I don’t know what I’d be drinking if it wasn’t for that especially here in sunny Florida. You had me at bacon with this recipe! This is my new favorite way to eat brussels sprouts!